Wood veneers are produced by cutting thin slices of wood from logs specially selected according to size, colour, grain figure and character. All our veneer logs are individually selected and purchased by a director of the company. Veneers are usually cut to a uniform thickness of about 0.6mm and there are several methods of cutting veneer, each effecting the visual characteristics of veneer. 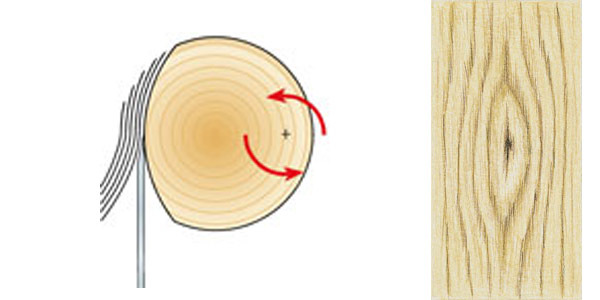 The log is cut in half, and the half log or flitch is then sliced straight across, parallel to a line through the centre of the log and tangential to the growth rings. This generally produces a veneer with a central area of strong figurative grain and a more linear effect at each edge. The log is cut in quarters, and each quarter flitch is then straight sliced, approximately at right angles to the growth rings. 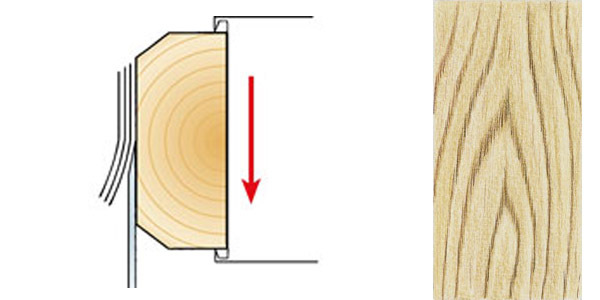 This generally produces a veneer with a relatively uniform linear vertical grain. This is used mainly for Oak species, which have medullary rays radiating from the centre of the log like the spokes of a wheel. The log is quarter cut and then mounted on a lathe, taking curved slices slightly across the medullary rays. This accentuates the vertical grain and minimises the flake figure of the rays. The log is mounted off-centre in a lathe. 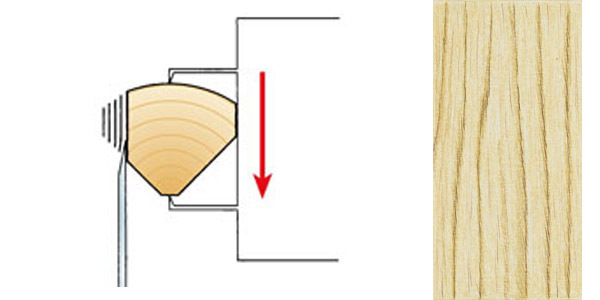 Curved slices are taken slightly across the annular growth rings, producing a veneer with some of the characteristics of both crown cut and rotary veneers. The log is mounted centrally in a lathe and sliced around the circumference, following the annual growth rings; this gives a bold variegated grain, and enables very wide leaves to be produced. 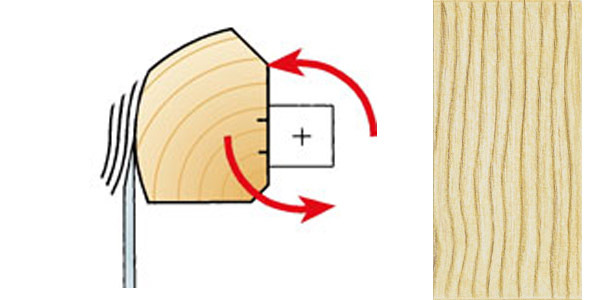 Continuous rotary slicing is also used for plywood and constructional veneers.